If you really want to feel your best, and you’re not already using an air purifier in your home or apartment, you may not realize how much a positive effect it can have on your health. These days, air purifiers offer so many health-boosting benefits that their popularity is exploding throughout the world. These “plug and play” small appliances are really easy to set up and use, and affordable options are available for every type of space. If you ever considered pollution to be just an “outdoor” problem, you should know that indoor pollutants can be just as bad, and sometimes even worse, especially if you live in an urban area or apartment. The truth is that pollution happens in both environments, indoors and outdoors. You can’t separate the two. Most of what you breathe in when you’re inside has migrated into your home from the outside. For example, without a good air purifier, you’re most likely breathing in pollens, pet dander, dust mites, bacteria, mold, factory smoke, automobile pollution, and more on a daily basis. Some people are more sensitive to bad air quality than others and feel the ill effects more rapidly. Others, however, don’t feel sick or develop allergies until they have had long exposure to these contaminants. In that case, severe health problems may develop which may have been avoided if preventative action had been taken. In this post, we’ll share with you some of the top ways that air purifiers can boost your health. Perhaps, these reasons to get an air purifier will persuade you to try one your home. Once you’re done reading, head over to our list of the top air purifiers to find ratings and reviews on popular products. One of the major reasons why people snore is because they have clogged nasal passages. In many cases, this clogging happens due to allergic reactions to dust mites, pet dander and allergen particles floating around the house. Over time, these types of impurities collect and build up on surfaces around the room. While a good air filter in a central air conditioning system may collect some of these allergy-triggering particles, there are a lot that never make it that far to get trapped. If you or someone in your house wants to reduce snoring, an air purifier for allergies can help. This device works on the ground level to collect the allergens that a central AC unit can’t reach. It does this by pulling air into the machine, trapping the bad particles, and then blows out clean, fresh air for you to breathe. The less allergens that get into the nasal passages, the less snore will occur. In the end, this inexpensive device can provide everyone in your house with a more peaceful sleep. Quite often, we get ill because we catch bugs from other people who live in our homes or visitors that stop by. When people cough or sneeze, they send germs out into the air. These actions also stir up existing pollutants that may have been dormant. People who are already sick will stay sick for longer due to exposure to existing pollutants. Those who aren’t sick will be more liable to catch things when germs and contaminants hang around interior air. One of the best reasons to get an air purifier is because it gets rid of harmful germs, bacteria and other ill-producing pollutants. Examples of diseases which are lung-oriented include COPD, Asthma and Emphysema. You’d be surprised how how many pollutants hang around in the air inside of homes and offices. In fact, the Environmental Protection Agency has concluded that indoor air is 2-5X worse that outside. Not only does outside air flow indoors and become trapped but also the increase in use of synthetic building materials, furnishings, personal care products, pesticides, and household cleaners attribute to low levels of indoor air quality. These pollutants then work their way into our lungs via the breathing process, which may set the stage for the development of lung-oriented diseases, or make existing lung-oriented disease symptoms worse. If you live in an apartment that’s inside or close to a city, you may also be exposed to fine particle pollution (PM2.5 and PM10) which can cause a number of cardiovascular and respiratory disease. Having an air purifier inside your home can help reduce your risk to those types of illnesses. Take a look at our guide on choosing an air purifier for apartment to find out more. Research has shown that ambient air pollutants are directly associated with a boost in glucose intolerance. And, this is one of early warning signs of diabetes. If someone in your family suffers from diabetes (Type I or Type II), you should know that using a high quality air purifier may assist with stabilization of blood sugar levels. The less contaminants that are able to invade the body, the less out of balance glucose levels will be. It’s a cozy feeling to sit by a roaring fire when it’s frigid outside. However, wood fires, coal heaters and wood-burning stoves tend to emit contaminants which negatively impact air quality. For example, wood tends to be a source of pollen spores and mold. When wood is burned, spores open up and move into the air. When you utilize an air purifier at home, you’ll be able to reduce this level of contamination and breathe cleaner air. Air purifiers are also great at removing smoke particles and the odor it leaves behind, leaving your home as fresh as can be. If you live in a northern climate, you may already know that closing your home up during the cold weather months makes it a veritable “breeding ground” for substances which contaminate the air. During this time, office workers are particularly at risk to being negatively affected by indoor pollutants, as most office windows can’t be opened. To keep stale and stuffy air at bay during the winter, your best option is to use an air purifier. Some of the best machines can exchange the air within a room up to 6 times per hour with fresh air. This not only removes invisible contaminates, but also makes it easier to breathe all winter long. Did you know that the heavy polluted air in China makes it all the way to America? Surprisingly, research has shown that contaminated air is blowing across the Pacific Ocean and into the U.S. While American air isn’t nearly as polluted as Chinese air, the polluted air that comes to us from China is often deadly. The World Health Organization estimates that 92% of citizens of Hong Kong have to breathe in air which is in this deadly category. 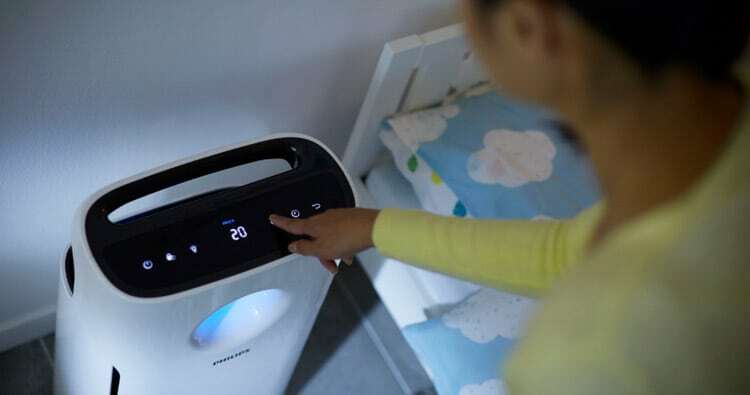 If you want to keep polluted Chinese air out of your home, you should invest in an air purifier today. The air pollution issue in China won’t be stopping any time soon, but at least you can protect yourself as much as possible from the exposure. Hopefully, the health benefits we shared in this post have helped you understand why getting an air purifier for your home or office is a good idea. If you want to feel better and enjoy a long life, while also protecting the health of family and visitors, an air purifier is a great long term investment.